The World Cup is only days away! All of my boys are super excited. I am keeping them busy with everything related to soccer. From the Panini sticker album to web resources on Brazil, these boys have it good. But recently, we discovered that there isn't much out there for a fun and educational World Cup app. I searched and searched and ended up just entering the key words "soccer" and "educational" and came up with this very thematic and educational game. 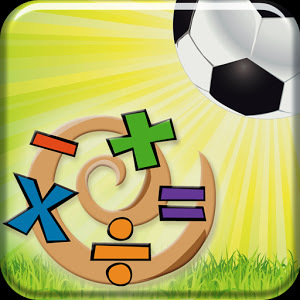 Brief Description: This fun and educational app will have kids aiming to answer quick thinking math problems correctly to score goals and win. 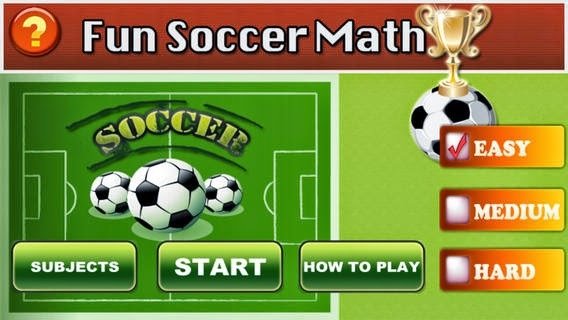 What my kids like: Fun Soccer Math is the only soccer app that my seven year-old owns, making it an instant hit. Diego loves the ability to play alone or with a partner. The friendly competition between two players makes it a lot more fun. He also likes the freedom of choosing between addition, subtraction, multiplication and division, allowing him to play an "easy" game or challenging himself. What I like: I like that this game is simple and educational. Teachers talk to me about having Diego practice addition and subtraction in his head quickly, making this app ideal for him. Mental math is important for all elementary age students. It will help their memory and enhance high problem solving capabilities.The soccer theme is important for my son because he lives and breathes futbol! This app is hands down mami and teacher approved. I'm having Diego do a little math practice before every big match this summer!